This film depicts real human tragedy and may not be suitable for all audiences. Viewer discretion is advised. The short film "The Country Doctor" (1909) is included in our program to illustrate the work of two of our stars: actress Florence Lawrence and cinematographer Billy Bitzer. The films starts with the camera moving slowly to show the serene landscape of a small town. Then we see the doctor enjoying a nice walk thought the fields covered with flowers with his wife and little daughter. The scene changes and now the doctor is trying to help his sick daughter. Suddenly he is called to attend to another patient - the little girl of a neighboring poor family. The doctor leaves in a hurry, telling his wife that he will be right back to check on his daughter. Attending to the sick girl of the poor family takes longer than expected. His maid keeps asking the doctor to return home, because his daughter's condition deteriorates. However, each time he wants to leave, the poor mother of the sick child implores him to stay. He is torn between his duties as a doctor and his obligations as a father. The film has a nice IMDB rating of 6.7, which is the highest of all films of that period. Florence Lawrence and Frank Powell raise a happy family in "The Country Doctor" (1909), director D. W. Griffith, cinematographer Billy Bitzer. Florence Lawrence and her family enjoy a nice day in "The Country Doctor" (1909), director D. W. Griffith, cinematographer Billy Bitzer. 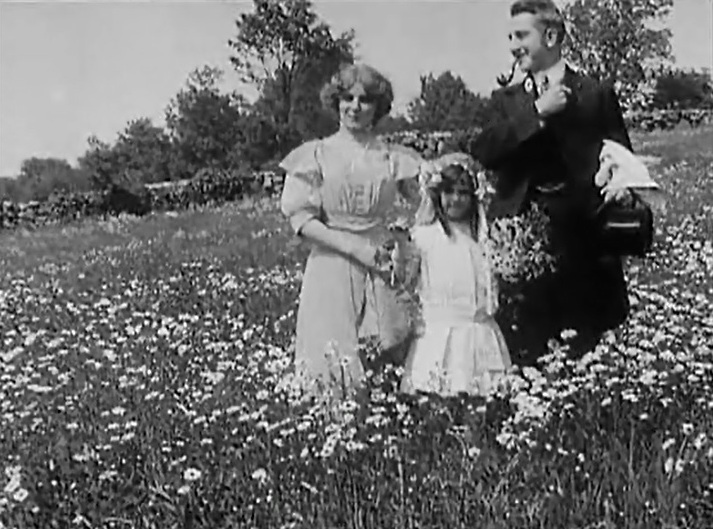 Florence Lawrence, Frank Powell and their daughter enjoy the flowers in "The Country Doctor" (1909), director D. W. Griffith, cinematographer Billy Bitzer. Florence Lawrence gets a flower from her daughter in "The Country Doctor" (1909), director D. W. Griffith, cinematographer Billy Bitzer. Florence Lawrence, Frank Powell and their daughter have a good time together in "The Country Doctor" (1909), director D. W. Griffith, cinematographer Billy Bitzer. Florence Lawrence, Frank Powell and their daughter are one happy family in "The Country Doctor" (1909), director D. W. Griffith, cinematographer Billy Bitzer. Florence Lawrence is very worried, Frank Powell not so much so, as their daughter gets sick in "The Country Doctor" (1909), director D. W. Griffith, cinematographer Billy Bitzer. After Florence Lawrence, Frank Powell gets very worried, too in "The Country Doctor" (1909), director D. W. Griffith, cinematographer Billy Bitzer. Florence Lawrence remains at her daughter's side as Frank Powell leaves to attend to another patient in "The Country Doctor" (1909), director D. W. Griffith, cinematographer Billy Bitzer. Kate Bruce and Mary Pickford watch Frank Powell check the younger daughter in "The Country Doctor" (1909), director D. W. Griffith, cinematographer Billy Bitzer. 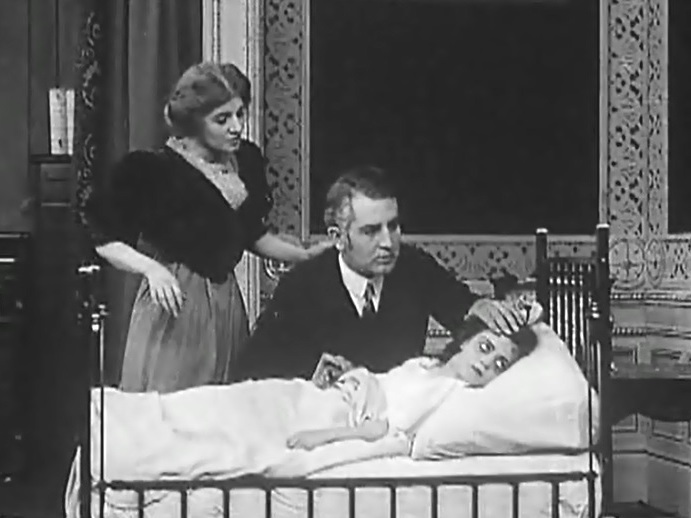 Kate Bruce and Mary Pickford watch Frank Powell help the younger daughter recover in "The Country Doctor" (1909), director D. W. Griffith, cinematographer Billy Bitzer.